the feeling of heaviness depends on you ! There are various varieties of these stones. 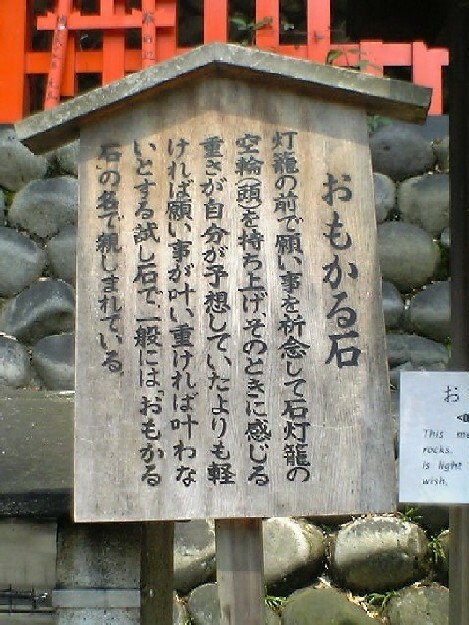 You make a wish and try to lift the stone (or statue, as we will see below) and if you can carry it (karui), your wish is granted. 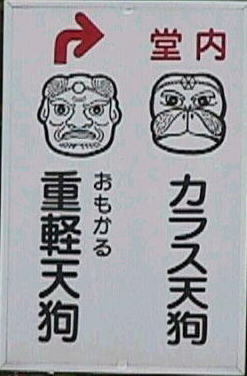 If you can not carry it (omoi), then you have to come back another day. A stone, named 'Omokaru-Ishi',is exhibited here. 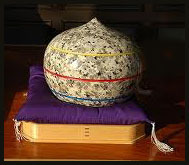 'Omokaru' is meaning 'heavy or light' and 'Ishi' meaning 'stone'. It's believed if you feel lighter than your presumption as your lifting, you'll live a fortunate life. 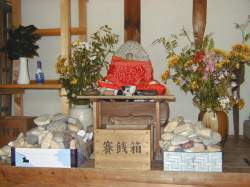 The stones are placed at the top of the stone lanterns. Try to lift them! Long long ago, there was this old woman, O-Kinu, who was looking for nuts in the nearby forest and found a stone that looked almost like a little Jizo. 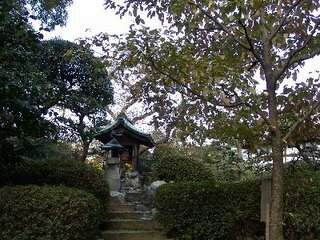 "Oh my," she thought, "that must be Kobo Daishi himself!" She lifted the stone without effort and carried it beneath a tall tree for protection. She came every day now and brought flowers and water for the statue too. Some days, she could lift it easily and other days, not a centimeter. She figured, this stone must have its heavy and light days. 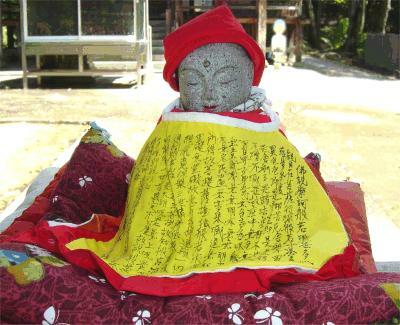 Later peopole came up with the story that if you can lift this Daishi after making a wish, it will be granted. Onomichi is often associated with stone crafts and many sculptures all over the city display the talent of the craftmen in the past. 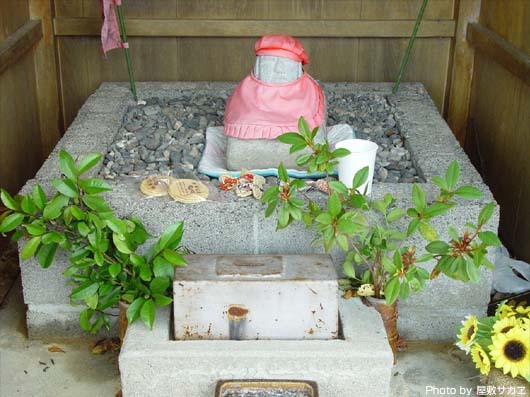 Omokaru Jizou in Taisanji Temple, Omokaru Tengu in Kongouin Temple (Kongoo-In, Saikoo-Ji) are mysterious set of statues when visitors make a wish and lift them and finds that they are lighter, their wishes come true. 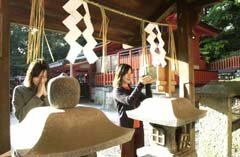 Spinning Stone of Yokozuna Jinmaku in Joudoji Temple is said that when you turn the stone while you make a wish and the stone feels light, then the wish will come true. First, you write your wish and a dream in the notebook there. There are lots of dream of many people in the notebook. Next, you lift the three stones in light order. Remember the stones are very heavy! 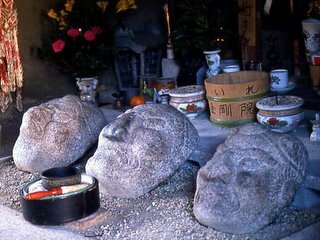 If you can lift all three stones, your wish will come true. Also called : Jizo to take in your arms. Gokuraku-Ji, Nr. 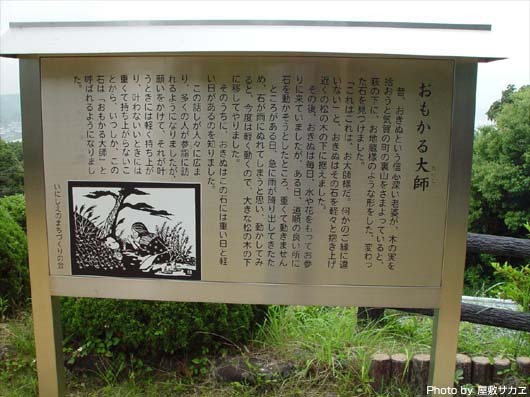 2 of the Shikoku Pilgrimage. 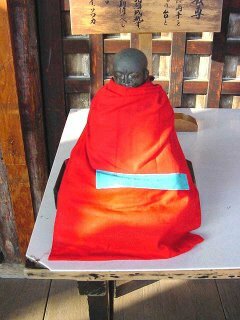 This Jizo stone was found by a fishermonger in a mound of empty shells at Ise Bay during the beginning of the Meiji period. 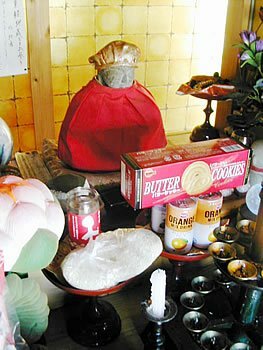 He brought it to the temple to make sure it would not bring bad luck to himself. With three lines in yellow, red and blue. Heavy-light stones and statues as well as stones for strenght competition (chikara ishi) are non-seasonal topics for haiku.